Casey Winn was born on October 5, 1966 in Fort Worth, Texas, USA. Primarily a self-taught composer and musician. He studied music theory, played the violin and viola in elementary and middle school. During this time he became a classical music fanatic and still is today. He continued composing string, and piano works and in early college while studying basic music theory and other classes began experimenting with electronic music and in 1989 left college to branch out on his own and started UMP Studios [United Media Productions], an electronic music studio in his home. Winn’s electronic-symphonic scores are composed, orchestrated, performed, and recorded in his home music studio realized through his own system of synthesizers, digital live samples and computer equipment. His music is more than just an absolute listening experience. A vast amount of inspiration comes from visual events. Short stories, novels and true life events will take you on many trips from A love story in Venice (A Tango in Venice-1992), Native American Indians with the famous Chief Joseph (Thunder Rolling in The Mountains-1993), The Life of the Spanish composer Manuel de Falla in Europe and Argentina (The Life of Manuel de Falla-1998), The Holocast in Poland inspired from a novel by Louis Begley (The Aryan Papers-1999), A grim science fiction tale of Robots and Humans in the 23rd century after the polar ice caps melted (AI: Supertoys Last All Summer Long-2002), A love story version of Edgar Allan Poe’s “Fall of The House of Usher” along with eerie dance sequences (The Fall of the House of Usher-2003), A Caribbean Sea Symphony inspired by novels of Ernest Hemmingway set in Cuba and Bimini Island (Santiago and Islands in the Gulf Stream-2004), to the recent 2 disc oratorio work inspired from The Great Prophets: Abraham, Noah, Moses, Jesus and Muhammad (Prophets: Men of the Desert God-2005). He composed Symphony No. 1 "The North Atlantic" for symphony orchestra and women's chorus in 1984. 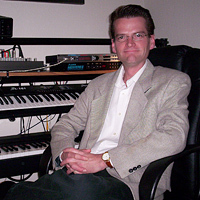 The composer currently resides in Ft. Worth, Texas in the Dallas/Fort Worth Metroplex.